Spaghetti with Mushrooms, Lemon and Basil - Wholly Delish! I love pasta! But as the weather heats up, a big bowl of hearty spaghetti just seems too heavy. This recipe for Spaghetti with Mushrooms, Lemon and Basil is the perfect option – meeting my craving for ‘slurpable’ spaghetti, but light and refreshing for a hot summer’s night! 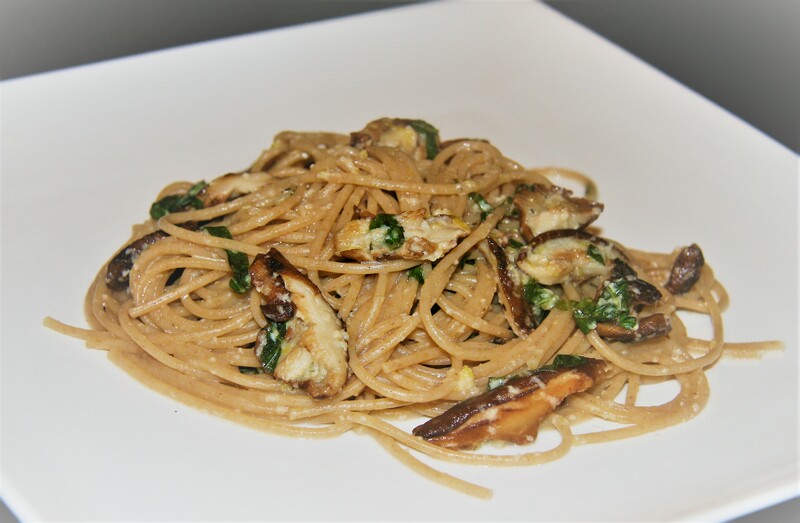 This Spaghetti with Mushrooms, Lemon and Basil is also perfect for whole wheat spaghetti. Since the sauce is so minimal – essentially just butter and lemon juice – it’s just meant to coat the noodles rather than being absorbed. Even my husband who generally turns his nose up at whole wheat pasta finds it works with this recipe. The tang of fresh lemons, basil from the backyard herb garden and my favourite shiitake mushrooms finished with freshly grated Parmesan…yum! I’m salivating just writing about it and I just ate it for dinner last night. This dish is likely going to make an appearance weekly this summer around here (or at least until I hear complaints). The recipe serves two – my kids’ palettes aren’t quite ready for these grownup flavours so this is just for my husband and I. But not to worry, with just six ingredients, it’d be a breeze to double or triple up for more portions. The recipe itself couldn’t be any simpler! Just don’t forget to grab 1/4 cup of the pasta water before draining to fill out the sauce before draining your Spaghetti. 1/2 CUP GRATED PARMESAN – it’s worth investing in a wedge for freshly grating if you don’t usually! Cook Spaghetti to al dente according to package directions. Sauté Mushrooms in butter over medium heat until cooked and nicely caramalized. Remove pan from heat and add the grated lemon rind, lemon juice, basil, Parmesan and pasta water. Add spaghetti and toss well. Serve immediately.